With the support of the European Union RDFG implements four year project in Tetritskaro municipality. Project aims to involve local people in the rural development process, as main actors and not as beneficiaries. To achieve this goal, Local Action group (LAG) of Tetritskaro has been established as a partnership between the public, private and civil sectors. For the position of the Executive Director, 27 years old Nino Tikurishvili was elected with absolute majority. 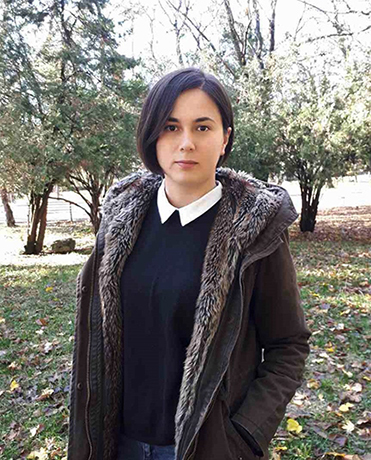 Nino is young and successful economist who decided to return to Tetritskato after spending six years in Tbilisi and use her skills, knowledge and experience in benefit of her home place. She graduated from Tetritskato high school and moved to Tbilisi to continue studies in the university. After receiving bachelor’s degree in Business and Management, she started job in one of the banks as service administrator. Nino worked there for 6 years and gained good experience, however she was yearned for Tetritskaro, so she quit her job and returned back with specific plans. “Working in the bank tought me a lot, it was a good start for me, and later I realized that I wanted to start my own business. Nothing is better than having your own business and doing what you love. Another reason that brought me back, is that I want to contribute to Tetritskaro development process. Our municipality has a huge potential and I want to motivate my fellow citizens to do our best for our region” – says nino. She heard about the “Rural Development for Sustainable Growth of Tetritskaro Municipality” project at the informational meeting. Considering her aims and enthusiasm, Nino didn’t hesitate joining the LAG and participating in board elections. Subsequently, she received most of the votes and became the Executive Director of Tetritskaro Local Action Group. Nino thinks, that main potential of the region is in tourism sector. Tetritskaro is full of remarkable places and beautiful nature, however, nobody knows about it. Publicity is low not only among foreign tourists but among Georgian people too. Therefore, along with the service and infrastructure development, PR is also very important. Nino says, that creating some space for entertainment and holiday will attract not only tourists, but also diversify lives of local people. Nino’s enthusiasm is obvious to everyone. Nelly Revazishvili, the project manager pins her hopes on her and expresses her joy about having such an active and energetic executive director of the LAG. “Nino has an ability to generate maximum from the existing resources, she can see positive side in everything. Her daring and enthusiasm is contagious and motivates others. She believes, that if she tries hard, she can change life for better in Tetritskaro. Our objectives are closely in line , hence I’m sure together we can achieve common goals” – said Nelly Revazishvili. As mentioned above, one of the reasons Nino returned to Tetritskaro, was starting her own business. While leading the LAG, she also starts producing dried fruit. Her main segment are tourists, so Nino plans to wrap different kinds of dried fruits originally. She desires to create multifunctional working space in Tetritskaro in the near future, where trainings, workshops, presentations will be organized and invited guests share their knowledge and success stories to local community.